Grab your glasses and warm up your fingers for this entertaining game called “evolving Objects – Coins and Diamonds”. With the help of dynamic objects the app focuses on both, visual and motoric skills. Come on and learn more! 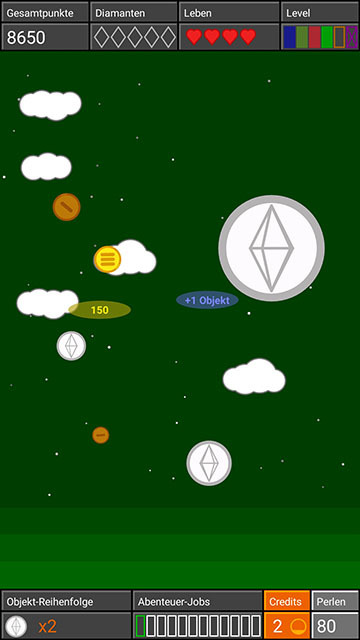 The gameplay is easy to describe in the words of the developer: “different kinds of objects appear on the screen in a random order and you have to tap on them to score points and to activate their special functions.” But you can’t just tap onto them and hope for the best, as there are damaging objects among them. So you have to have a good eyesight and quick reaction speed. The selling point of this game is definitely the thrilling gameplay. It is fun, fast-paced and challenging but do-able. The objects that you need to tap to destroy have various skills. 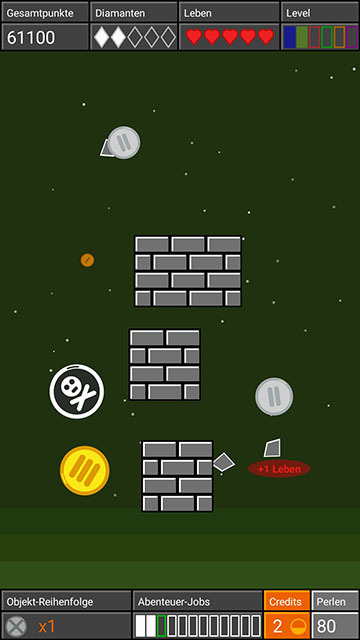 You can gain more time, an additional life, the screen might freeze; the bomb, the little ghost and other items can help you during the levels. However, lasers, aliens, skulls, black holes and other sundry obstacles might hinder your progress. The game is very easy to understand, but in case you need a further explanation or a brush up of your knowledge there are plenty of explanations at your disposal. “Evolving objects” is a solid game and with just a few minor tweaks it could be even better. After each level interstitial screens appear to tell you your gained adventure points et cetera. But they… load… so… slowly, when all you want to do is tap, tap, tap. Faster loading screens would be a great way to keep the anticipation up. Secondly, I definitely want an option to return to the game. When an object appears too close to the right hand bottom side, my finger sometimes accidentally clicks onto the overview button of my phone as well. But whenever you blend out the game screen (because of messages, an alarm clock or whatever reason), you can’t go back to your game. Instead, you have to close and open the app again. Lastly, I think the game design would benefit from new fonts. It would look even better and more professional with a modern font instead of a good old standard one. No need for a wrecking ball! If you want to test you visual and motoric skills, download this fun game here.